The pieces are falling into place for Borussia Dortmund's long term aspirations. After a rough start to 2018, they seem to have found their best form on the pitch while also showing us the course the team needs to maintain in order to fight again for the biggest prize in German football. bundesliga.com analyses how Michy Batshuayi's dream debut, Andre Schürrle's rebirth, Christian Pulisic's limitless potential and Marco Reus' leadership are the keys to a bright Black-and-Yellow future. Watch: Borussia Dortmund's revitalised attack with Reus! Since his Deadline Day arrival to Dortmund, Michy Batshuayi has made it his personal mission to sweeten the bitter aftertaste of Pierre-Emerick Aubameyang's exit to Arsenal. His joyful demeanor and flair in front of the microphones, accompanied by his love declaration to the colours yellow and black of SpongeBob SquarePants and (of course) his current employers were already encouraging for a squad and fandom in dire need of a morale boost. But then he started scoring. And scoring. And scoring. Three goals and one assist in his first two games are numbers that speak for themselves, but most impressive of all is the Batsman's involvement in build-up play. He's an amazing target man up front, but he's also able and more than willing to pull back and steal the ball in midfield. Although BVB may not have him beyond the end of this season, Batshuayi is still an important asset to the team's near future. 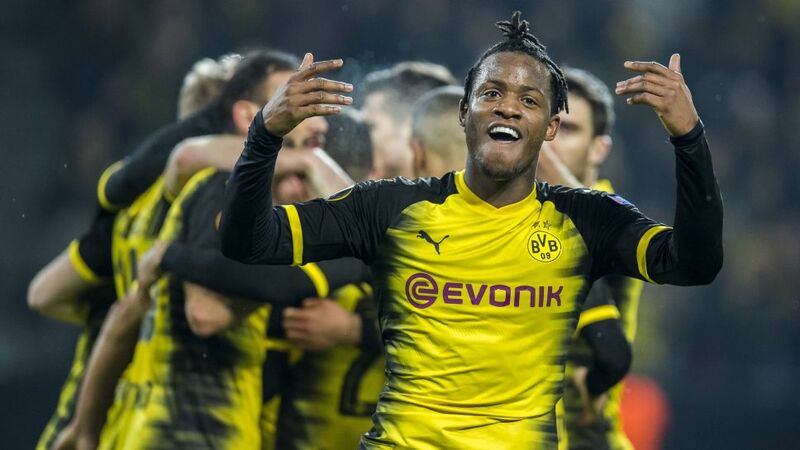 Having seen what Batshuayi can do, both on and off the pitch, Dortmund will go into the summer transfer window with a clear idea of the kind of player they must sign as a permanent centre-forward. While Aubameyang's goal ratio is indisputable, the team as a whole seem to benefit more from a bigger team player, from someone able to think not only on how to finish a goal opportunity, but how to create it. Also, they need to seek out a player who loves being at Dortmund as much as Batshuayi has clearly indicated. They need commitment with the cause. Watch: Christian Pulisic won December's Goal of the Month! Whatever they decide to do in the long term, they need to make sure to exploit Pulisic's potential to the fullest. He currently looks comfortable making plays from the right wing and finishing them. If individual form remains stable until the end of the season, that might mean giving less minutes to summer recruit Andrey Yarmolenko, but when you have a once-in-a-lifetime player like Pulisic, you need to continue giving him the space to grow. Dortmund fans have had to wait one and a half years to see the best version of Andre Schürrle, but patience seems to have paid dividends at the Signal Iduna Park. Since his arrival in the summer of 2016, there were high expectations for the Germany World Cup winner to finally regain his form from his early days in Mainz and Leverkusen. Peter Stöger's arrival may have been the spark he needed to reignite his inner flame. Although the Austrian coach's experiment with Schürrle as a number 9 against Hertha Berlin proved unsuccessful, Stöger trusted his player to perform on the wing against Cologne and then Hamburg. This trust was repaid with a goal and an assists in the last two games. As with Batshuayi, the numbers seem to tell the whole story, but there is more than meets the eye. Schürrle's rebirth is evident in his overall performance. He looks more confident, plays a bigger part in the team's structure, and is more involved in crucial attacking chances. If BVB can depend on this version of Andre Schürrle, they will have a great tutor/competitor to inspire Jadon Sancho in the coming months or even years. "Form is temporary, but class is permanent." So goes an ancient football adage. Reus' return from injury against Hamburg was a living demonstration of this. Since the start of the season, Dortmund always looked like something was missing. They lacked someone capable of turning the game on its head with just one move. Someone who could see the plays that no one else could. Welcome back, Marco Reus. While Dortmund's squad is loaded with talent and potential, Reus is the star talent that a squad can be built around. The captain's armband is not a fashion statement for the Dortmund native, he understands his role as the creative engine of the team and has proven again and again that he's up for the task. At this point in his career, the potential of yet another long term injury is a crux that will hang over him inevitably, but if Dortmund are serious in their intention of challenging Bayern once again, they need to bank on their strengths. Reus is the biggest of them. Click here for more Borussia Dortmund news, views & features!